I grew up in a house filled with music -- classical German music from composers like Mozart, Bach, Beethoven, Haydn and Schubert. I don't think I ever heard American music, especially American pop culture music, until I was old enough to seek it out myself -- which, in Berkeley in the 60's, meant heading downtown to catch a group like Country Joe and the Fish playing at a local park. 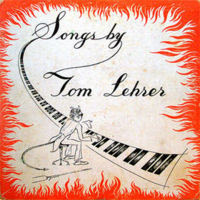 One American musician who my parents did like was Tom Lehrer, probably because his music was as intellectually stimulating as it was entertaining. I remember plopping myself down on my belly on the crimson red carpet in our living room, propping myself up on my elbows, and studying the black & white drawing of Lehrer-the-Devil playing the endless piano keyboard that graced the tattered orange cover of my parents' 78 rpm record. This song about the chemical elements was typical of Lehrer's intelligent humor. I can't help wondering if he and Richard Feynman ever met... Now THAT would be a concert! I adore Tom Lehrer's ditty about nuclear war... I haven't heard the actual song in ages, but when I was growing up, it was one of the few LPs in my family's record collection that got played regularly. I grew up listening to him over and over and over... and for WIW, I think they probably did, lol.